This past spring, while watering an Ash tree (Fraxinus) I planted in a small side yard several years back, I almost stepped on a Solanum lycopersicum. This tomato had sprouted next to an outdoor rocking chair that sat on a narrow gravel-covered strip of soil that was wedged between a small patch of concrete and the fence. Over the weeks, as I watched the plant stretch upward and vine outward, this unexpected volunteer won my heart. I couldn’t bear to pull it up. So I did what bleeding heart gardeners do when stuck between rocks and hard places. 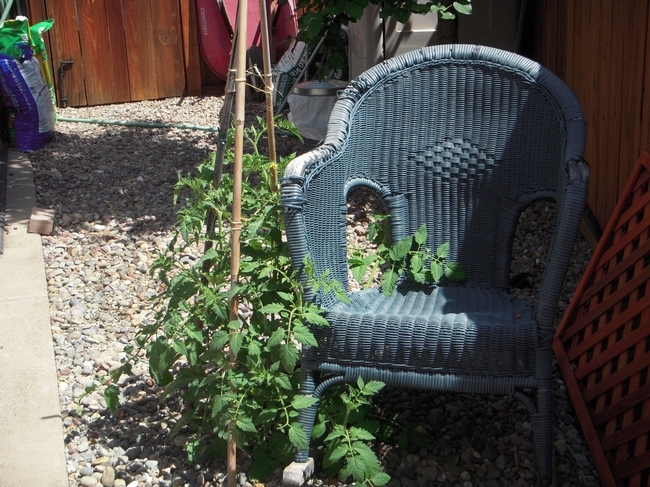 I pounded in a stake to secure the tomato plant’s voluminous growth and draped its vines across the lap of the chair. When the concrete was no longer passable, I lifted the fruit-filled stems atop two plastic storage bins. 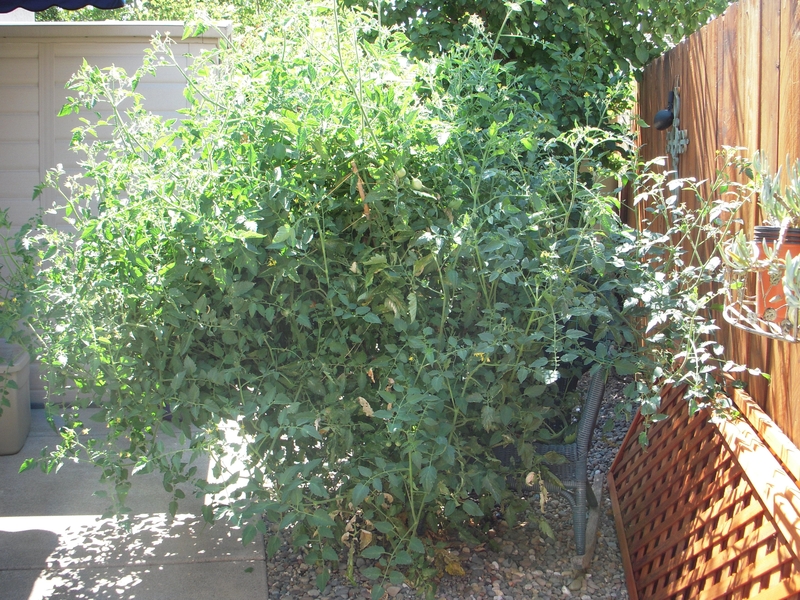 During my research into why this super star of my side yard is outperforming every tomato I ever planted in my entire life, I realize its success is mostly due to the soil, which was fallow for years, despite being gravel-covered clay. But I also learned that volunteer plants can increase nematode populations. Guess what? I can’t even reach the roots to inspect them for root knot nematodes (See UC ANR Publication 3470, Tomato nematodes). Then I wondered if my volunteer is a disease resistant variety? I don’t know. All I know is what I see. Foliage over 6 feet tall and 6 feet wide and growing by the day. No evidence of chlorosis virus, spotted wilt or yellow leaf curl. No verticillium wilt or Mosaic virus — YET. So . 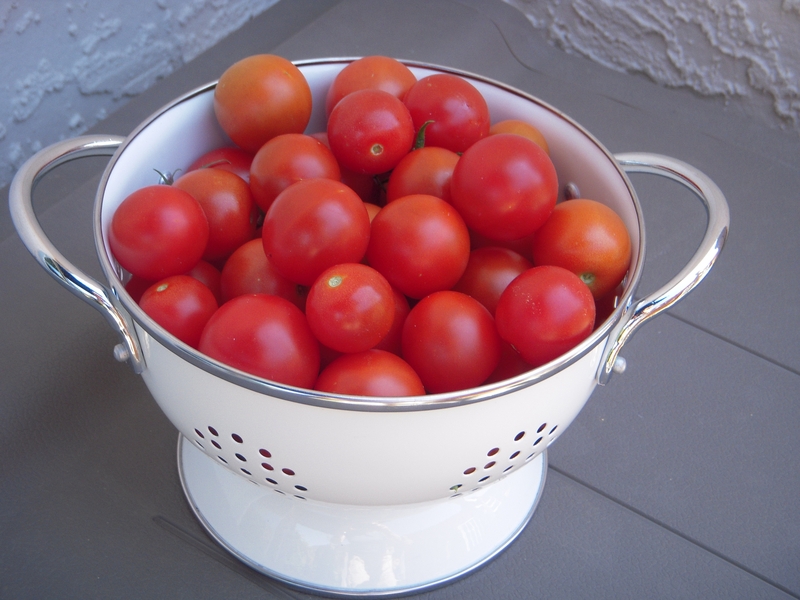 . . as I reap this year’s harvest, I envision next year’s volunteer — large, lush, lovely, drooping with pick-ready vine-ripe tomatoes. But I know super stars don’t last and reality gardening seldom measures up to the plot of dreams.